INVESTIGATION UPDATE 7/30/2018: The TVF&R fire investigator has concluded their investigation and determined that the fire was caused by a child misusing fire. The child will undergo a youth intervention program as a result. No additional information will be released. At 5:22 p.m. today, callers to 911 reported a shed and trees engulfed in flames at the corner of Dollar Street and 16th Street in West Linn. 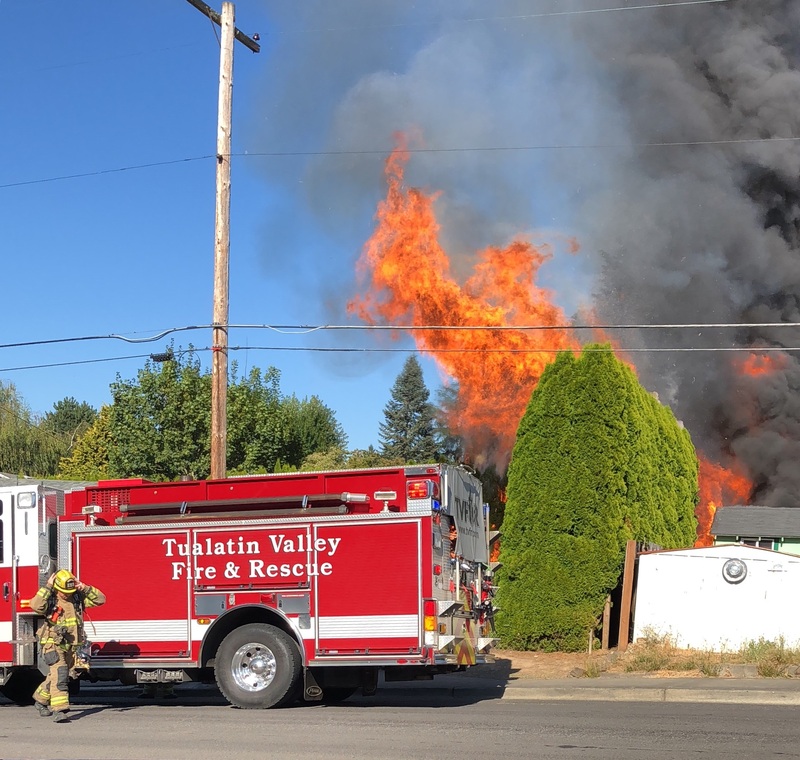 Firefighters from West Linn Station 59 were first on scene and found significant flames and smoke at the location coming from a shed and a large arborvitae hedge. The crews also noticed that the fire had quickly spread to the eves and attic of an adjacent townhome. Due to the size of the fire that had now threatened at least one home, the call was upgraded to a second alarm to bring in adequate resources to battle the fast-moving fire. Crews immediately began an aggressive fire attack, while additional incoming firefighters assisted with searching for occupants in the adjacent homes. Fortunately, everyone had safely evacuated. It took approximately 45 minutes for firefighters to gain control of the fire. Due to excessive hot temperatures and rapid work required to fight the quick-moving fire, the call was upgraded to a third alarm to bring in even more resources. Firefighters from additional TVF&R stations and mutual aid neighboring fire departments assisted in cycling crews in and out of operations to prevent heat exhaustion. One adult was displaced from the affected townhome. Three adults, two children and one dog were displaced from the home adjacent to the shed and arborvitae. Red Cross will assist with providing temporary housing and any other essential needs. A TVF&R investigator is currently on scene working to determine the cause of the fire, which is unknown at this time. TVF&R was assisted by Lake Oswego Fire, Clackamas Fire District #1, Gladstone Fire, AMR and West Linn Police Department.